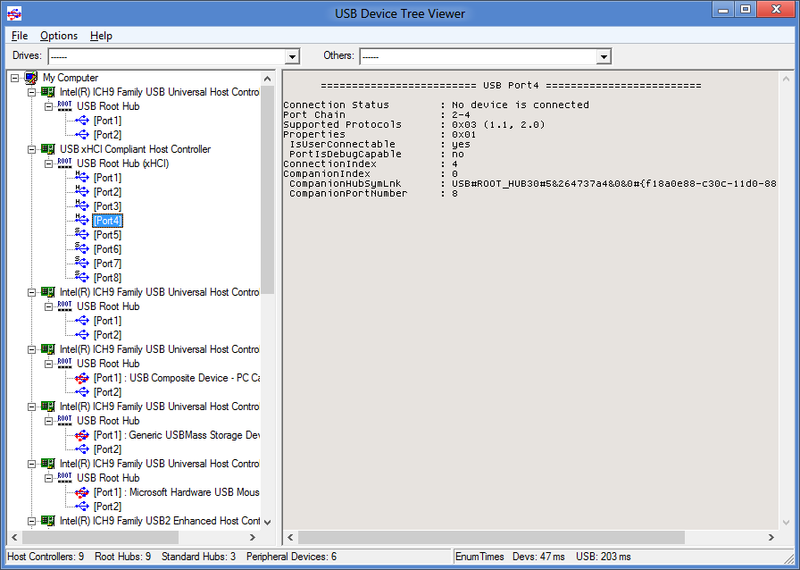 The USB Device Tree Viewer, short UsbTreeView is based upon the Microsoft "USBView" sample application found in the Windows Driver Development Kits and now standalone at GitHub. But it is source code only, there is no executable for end users provided. 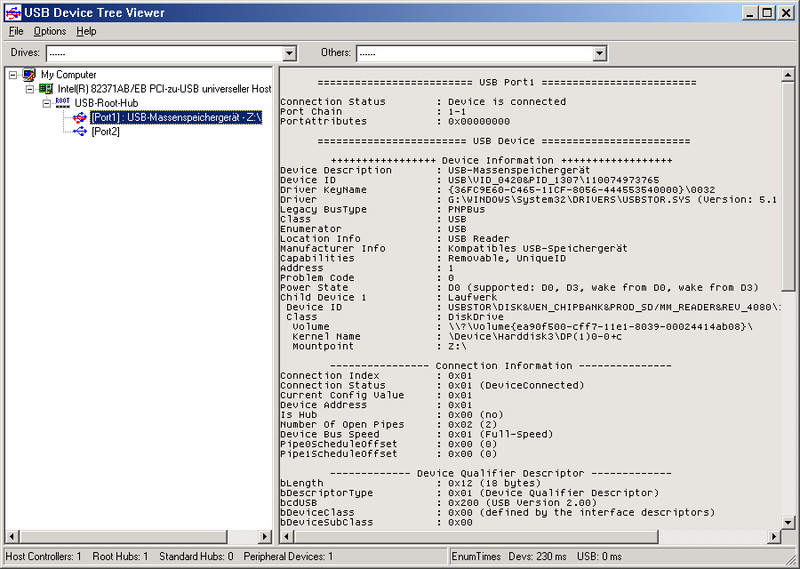 Meanwhile USBView comes as executables as part of the "Debugging Tools für Windows", see here: USBView. Bugfix: Under XP the UsbTreeView process did not end after using "Safely Remove"
New: Option "Always On Top"
New: Workaround for a strange phenomenon: On some Windows device notifications come with wide strings even RegisterDeviceNotificationA was used; This is dealt with now. Here we have an old XP Computer with one single USB 1.1 host controller. As every USB host controller it has exactly one USB root-hub. The root-hub has two ports, at port 1 there is a USB mass storage device attached which is mounted at drive letter Z:. Even the USB drive is USB 2.0 it is running at Full-Speed only because it is attached to a USB 1.1 hub. 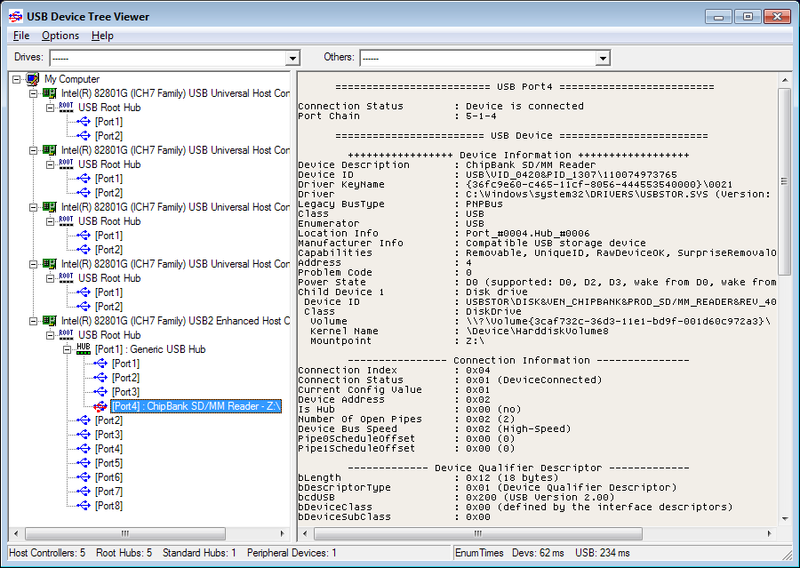 The USB High-Speed controllers usually have the keyword "Enhanced" in their device name. Since Vista the "USB Hub Capabilities" can be checked for the "HighSpeed" flag. At port 1 of the Enhanced controller there is a USB High-Speed hub attached and at his port 4 there is a USB mass storage device attached which is thanks to USBDLM mounted at drive letter Z: again. Here it is running at High-Speed. Newer Intel chipset have no more USB1 root hubs. Instead there are two integrated standard hubs which translate Low and Full-Speed into High-Speed. Intel calls them "Integrated USB 2.0 Rate Matching Hub". Here we have a Win8 Computer with a Texas Instrumens TUSB7340 USB SuperSpeed controller card. Windows 8 has native support for USB 3.0 SuperSpeed and an enhanced USB stack which delivers more information, e.g. which speed each port supports. Therefore UsbTreeView can show a 'H' in the icon of the high-speed ports and an 'S' for the SuperSpeed ports. The TUSB7340 has 4 physical ports. 4 logical ports are for low, full and high-speed devices and another 4 for SuperSpeed devices. Windows 8 also delivers information about which logical ports belong together. In the screenshot you see that the selected port 4 has the CompanionPortNumber 8, this means that port 4 and 8 share the same physical port. Simple BadUSB devices are USB composite devices, so they keep their usual functionality but have an additional 'bad' function as a keyboard or a network adaptor. Note that it is a Composite Device, that is has two child devices - the expected disk and the potentially bad keyboard. Other old releases are available under the usbtreeviewNNN.zip sheme.